Honey bees collect pollen from an extremely diverse array of flowering plants. Beekeepers, farmers, and scientists are often interested in identifying pollen collected by honey bees to figure out which plants are visited by bees at a particular location or during a particular time of year. Traditionally, this has been done by manually sorting pollen pellets according to color and then identifying individual pollen grains using a microscope. This method can be effective, but it is extremely time-consuming, and only an experienced pollen analyst can identify pollen reliably. At the OSU Bee Lab, we’re developing a new method of pollen identification that uses a technique called DNA metabarcoding as an alternative to microscopic analysis. 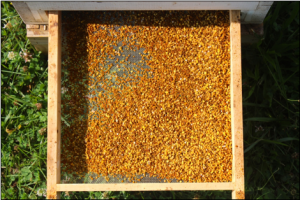 We begin with a mixed sample of pollen, straight from the bee hive–no color sorting is required. Then, we grind up the pollen and use a special filtration system to isolate DNA from all the different plants represented in the sample. Using a DNA sequencer, we look for particular segments of DNA that differ slightly between different types of plants–these can be thought of as DNA fingerprints or barcodes, which is where the name of the technique comes from. Using these “barcodes”, we can determine which plants the honey bees visited to collect their pollen, and we can do it much faster and cheaper than we could using traditional microscopy. You can read more about this project in our recent publication in the journal Applications in Plant Sciences. Here in Ohio and throughout the Midwest, honey bees are kept in landscapes that have been radically altered by agricultural and urban development. Are such landscapes able to support healthy honey bees? Are bees in cities better off than those in cropland? How do urban and agricultural landscapes compare to semi-natural forests? These are some of the questions we’re trying to answer at the OSU Bee Lab. Beginning in 2012, we’ve been working with beekeepers across the state to track the success of new colonies started in the spring from package bees. Using satellite data and geographical information system (GIS) software, we analyze the landscape surrounding each colony in our study. We then look for relationships between landscape composition and the level of colony success reported by participating beekeepers. The results of our study are in, and we hope to publish them in the coming months. Check here for a link to the published study once it is available. Apart from artificial feeding, honey bees depend almost exclusively on floral nectar and pollen to meet their nutritional needs. Consequently, honey bee nutrition is closely tied to the community of flowering plants that grow in the vicinity of the colony. In Ohio, most beekeepers keep their colonies in either urban or agricultural landscapes. Cities and farmland can differ dramatically in the diversity and abundance of flowering plants they support, which may have profound consequences for honey bee nutrition. 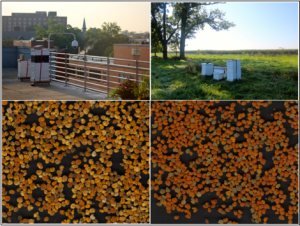 To better understand honey bee nutrition in urban and agricultural landscapes, we are collecting and identifying pollen from colonies located within the city of Columbus and in outlying farmland of Madison County. Our goals are to compare and contrast urban and agricultural landscapes with respect to (1) the taxonomic assemblage of collected pollen, (2) the nutritional quality of collected pollen, and (3) the seasonal patterns of pollen collection. This project is ongoing, and results will be posted when available.